While much of the winter season is focused on basketball and wrestling, the area’s track stars did plenty to display their talents during the indoor season, showcasing just how fast and powerful they are. Several area athletes did that better than most this winter, going up against the state’s best and coming away with excellent results. As a result, the five members on our 2017-18 All-Herald Indoor Track Team ran, jumped and threw their way up class and state leaderboards to make this squad. Southington’s Amanda Howe needs no introduction to those who follow the sport. The senior is making her third appearance on our team and with good reason. Howe once again dominated competition this season, finishing as the runner-up in both the Class LL and New England championships, while winning the State Open. She then competed at the New Balance Nationals where Howe placed eighth in the shot put and 11th in the weight throw. Those strong performances earned Howe her third all-conference nod. She will be continuing her track career with the University of Iowa following the spring season. Her teammate, Megan Biscoglio, is another familiar name on our All-Herald team. The senior was terrific in the pole value, where she consistently ranked near the top of meets. 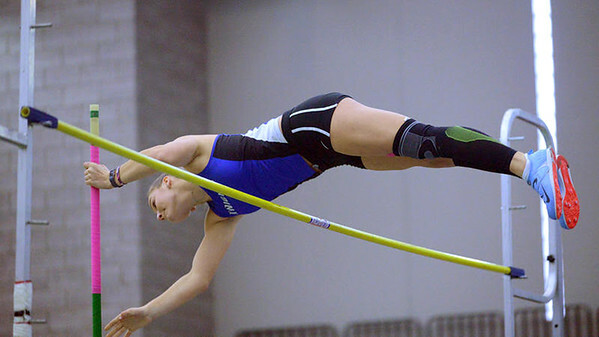 Both a CCC and state champion in the event, Biscoglio set a school indoor record of 12-2½. That personal best also helped her tie for sixth place at the New Balance Nationals meet. A SCC Coaches Invitational MVP, National Honors Society member and high honors recipient as well, Biscoglio will be continuing her track career at UConn. Rounding out the girls portion of our team is Berlin’s Patricia Mroczkowski. The junior was among the top performers in the long jump come postseason time. Mroczkowski took the Class M title in the event after jumping 5-4, only to have another strong outing in the State Open, where she took second with the same distance. With another year still to go, expect even bigger things from Mroczkowski in the coming seasons. On the boys side, Jaylen Rivera turned in a strong senior campaign that is sure to carry over to the spring. Rivera placed fourth in the Class LL championship meet in the 55-meter dash with a time of 6.72, 10th in the 300-meter dash thanks to a time of 37.86 and helped lead the 4x200 to an 8th place finish. At the State Open, Rivera took 8th in the 55 with another 6.72. A team captain and a two-time honor roll recipient, Rivera will be attending Post University in the fall for football and/or track. Rounding out our team is Plainville’s Collin Martin. Although just his second year in the sport, Martin turned in quite the senior season that included an all-conference selection in the shot put. Martin placed second in the CCC, Class M and State Open meets, setting a personal best of 53-7½ at the Open. The senior then went on to New Englands, where he earned a top-10 finish, and from there, the New Balance Nationals, placing 52nd. The five on our All-Herald team have proven to be the best of the best and will be tough to replace next season. Posted in New Britain Herald, Berlin, General Sports, New Britain, Plainville, Southington on Tuesday, 10 April 2018 14:17. Updated: Tuesday, 10 April 2018 14:19.